Survivors of Suicide is an ongoing support group for those who have lost a loved one to suicide. The group can offer support and healing, no matter where you are in the grieving process. In this group, participants have the opportunity to learn healthy coping and healing skills and practice using them to process emotions. Groups are facilitated by experienced clinical social workers from Michigan Medicine who share information about the bereavement process and ways grief affects everyone. The group creates an environment where survivors feel supported as they share thoughts and feelings. Survivors of Suicide is a caring community and a support network of people who know what you’re going through. Survivors of Suicide meets twice a month, typically the second and fourth Thursday of the month from 7-9 p.m. It is free, but registration is required. To register or learn more, please call (734) 936-5893 and ask for John Kettley or Jim Svensson. You can also email survivors-of-suicide-group@umich.edu for more information (PLEASE NOTE: Email is not secure; do not include personal health information when emailing). The Psychological Clinic can be reached at (734) 764-3471 for questions about meeting location. 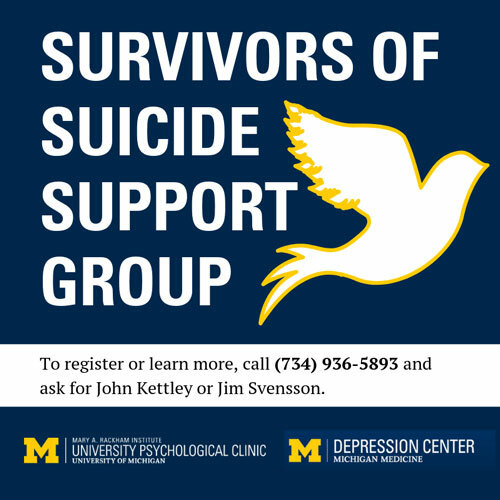 Survivors of Suicide is hosted at the University Psychological Clinic and facilitated by clinicians from the Depression Center at Michigan Medicine. Who: Anyone who has lost a loved one to suicide. This is an adult group, so 18 years and older please. What: A supportive group to help you process your grief and emotion related to loss due to suicide. When: Ongoing. Sessions are four months long and meet the second and fourth Thursday of each month from 7-9 p.m.